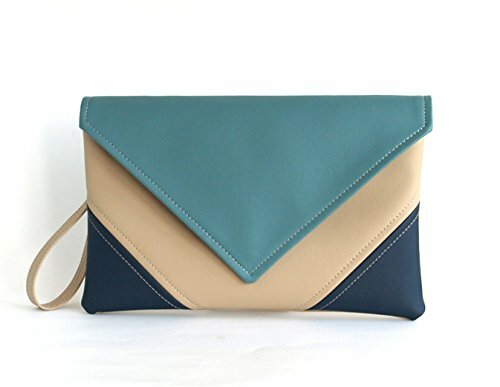 Clutch Bag envelope Hanmade Blue Navy Beige Purse Vegan Eco Faux leather Handbag Strap Evening Bag wedding bridesmaid by LudaMelnick at Nicky's Blog. Hurry! Limited time offer. Offer valid only while supplies last. Handmade clutch. Made of vegan leather, fabric inside. Details: Color- blue, navy, beige. Pressbutton magnetic closure. There is one inside pocket. Handmade clutch. Made of vegan leather, fabric inside. Details: Color- blue, navy, beige. Pressbutton magnetic closure. There is one inside pocket. Vegan leather wrist strap. Vegan leather strap length - 100 cm (39,4"). Approximate Dimensions: Width: 11.4" (29 cm) Height: 7.5" (19 cm) We hope you like what you see! Thanks for stopping by! If you have any questions about this product by LudaMelnick, contact us by completing and submitting the form below. If you are looking for a specif part number, please include it with your message.